After clashing with Ramūnas Karbauskis in September, J. Džiugelis departed the Farmer-Greens Seimas group. "As you may know, I withdrew from the ruling Lithuanian Farmers and Greens Union Seimas group in autumn. I did this in protest of the methods it is ruled by and the personal attacks aimed at me," J. Džiugelis said. 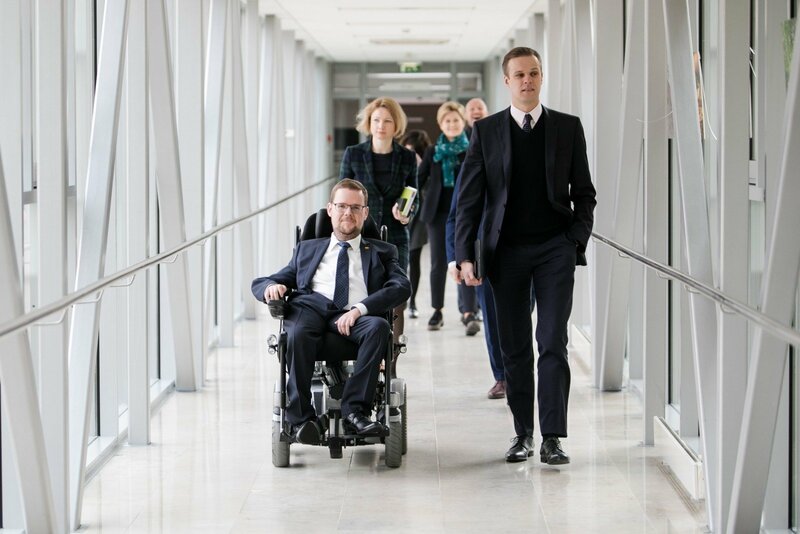 He stated that already then he received invitations to join from a number of other Seimas groups, but decided to not hurry and started work in the mixed [independent] Seimas group. "Nevertheless, seeing R. Karbauskis' pursuit of accumulating power in his hands, nominating Saulius Skvernelis as the "Farmer" candidate for president, I realised that I cannot stand aside from the political processes ongoing in the country. I do not want to wake in a country like Hungary, Belarus or Russia, where power is more important than law and the ability of those thinking otherwise in public discussion and the country's political life is restricted," J. Džiugelis spoke. The MP has endorsed Ingrida Šimonytė's bid for presidency and explained that it is him valuing fundamental matters such as the freedom of speech, the Constitution and respect to the people that he has in common with the Conservatives. TS-LKD leader Gabrielius Landsbergis shared his impression that many changes are ongoing in Seimas currently. "Changes are ongoing, the opposition uniting is more significant than it may have looked at first glance. It creates a sort of wave, a clear alternative is displayed in front of the principles that individually we may already have been opposing for a time. I believe that this wave inspires people to unite and fight together," G. Landsbergis said. The TS-LKD leader mentioned open doors for all that feel abused by R. Karbauskis and wish to escape him. "In terms of ethics, from a humane side, the way R. Karbauskis behaves toward his Seimas group colleagues is unacceptable. 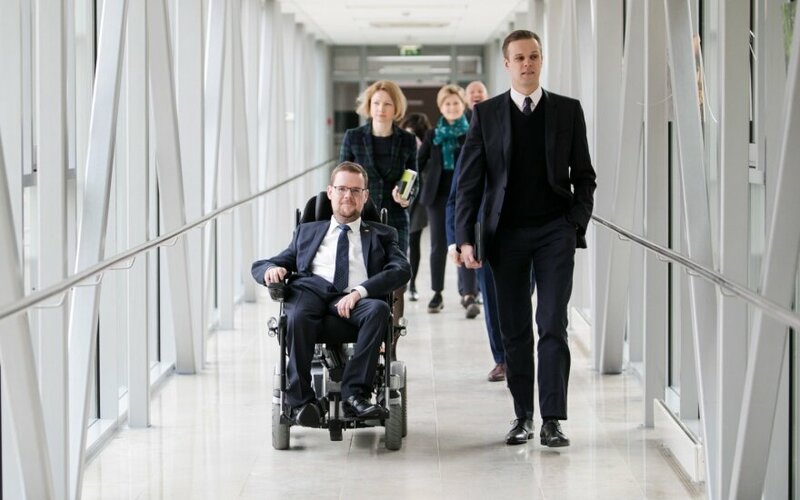 If a person, who dares oppose and is threatened with prosecution and other such matters, which was experienced by a number in Seimas, I believe that is unjust. Such display of power is only acceptable in a country to the East of us. [...] I am prepared to help everyone, who flees from such abuse, simply because it is human aid," G. Landsbergis said. In February, independent MP Raimundas Martinėlis also moved from the Farmer-Greens group to the Conservatives. Currently, the TS-LKD Seimas group has 33 members. "Farmer" leader Ramūnas Karbauskis views J. Džiugelis' move as a "natural decision of an individual whose values match the Conservatives'." "We were mistaken in inviting colleague Džiugelis because we did not consider his value stance. Now, having finished his political journey to the Conservative Seimas group, I hope that he will migrate no further and that it reflects his values," R. Karbauskis said. According to him, J. Džiugelis' decision will not prove to be an obstruction to the majority's work. "He was in the mixed group and would vote against us, this will not change. Simply, he will now be a member of the Conservatives' group and will vote the same as a month, two or three ago," R. Karbauskis stated.